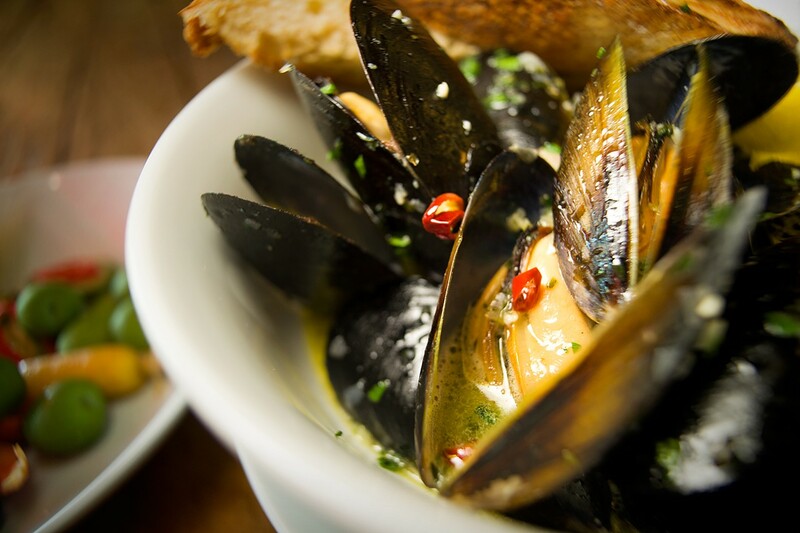 The mussels at The Cook and Her Farmer come in a garlicky beer broth. Hours: Tue.-Sat. 9 a.m.-6 p.m. Although it only recently opened in May, The Cook and Her Farmer already feels familiar, an intimate fixture in bustling Old Oakland. Its owners are cookbook author Romney Nani Steele, whose parents run the popular Nepenthe restaurant in Big Sur, and Stephen Day, a one-time schoolteacher and oyster fisherman. Day and Steele developed the menu — mostly sandwiches, salads, big family-style bowls of mussels, and platters of oysters — during a series of local pop-up events, and it's well ensconced in the tenets of California cuisine. The menu is small, focused, and changes daily, though a number of exceptional dishes seem to have a permanent place on the chalkboard. 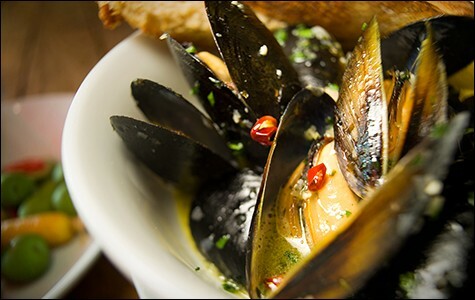 If you're a lover of shellfish, get the mussels or clams. And if you aren't, get them anyway, because you very well might be converted. Both are exquisitely tender, with a sweet, oceanic perfume. They come in a beer broth with garlic and tarragon, and are served with toasted bread. The broth is sweet — almost creamy — with a yeasty body from the beer. Another knockout is the grilled cheese sandwich. The menu states that it's the Best Ever, and I can't disagree: It's well-oiled, crispy, and mildly pungent. The bread is a rustic whole-grain and has a chewy crust. An earthy combination of gruyère and jack cheese spills out the sides and through the pores of the bread, crisping on the grill. The whole sandwich is then dusted with grated pecorino. A bit of rhubarb mostarda — a fruity, mustardy Italian condiment — or, if you like, prosciutto provide a sweet or salty (or both) counterpoint, and a soft pickled carrot sits next to it, along with fresh pickled cucumber slices and a few olives. Napkins are necessary. The garlicky-smelling Kennebec French fries are another standout, owing to their complex, creamy texture, which is neither mealy nor uniform. Part of the surprise of the place is how affordable it is. Sometimes the dinner menu includes a good flatiron steak drizzled in a sweet-sour chimichurri sauce for $19.50. Charred vegetables such as okra, sweet radicchio, and bright red peppers are served on the side, and while I've never had radicchio taste so sweet, the peppers were too spicy to be enjoyed on their own. Other items were also generally straightforward, with personal touches that gave them fresh appeal. A scattering of blackberries graced the side of a pristine tomato and mozzarella salad, and meaty chunks of watermelon accompanied the feta and arugula salad. The blackberry lemonade, which appeared only once during my trips to the cafe, was everything it should be — sweet but not syrupy, luscious with muddled fruit, and zingy from thick slices of ginger. The dishes are substantial. Most are meant to be shared. It's difficult to eat here alone, partly because it's hard to order only one thing. The service is similar to the food — unfussy and disarmingly generous at times. And the owners have been known to pour you an extra glass of wine if you sit there long enough. The kitchen is wide open and small, and every effort, from slicing bread to shucking oysters, is on display. With its down-to-earth style and seemingly effortless — yet exquisite — food, The Cook and Her Farmer is on track to become a quintessentially Oakland spot — one of those places that isn't just in The Town, but of it.